Enhance the look and security of your above ground swimming pool with our resin pool fencing from Vinyl Works Canada. This rugged resin fencing includes an injection molded mounting bracket that is extremely strong and adjustable (telescoping) for various pool designs. These premium pool fence kits meet most local pool building codes. 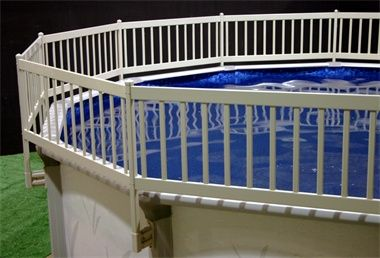 NOTE: We stock & sell ONLY the Premium Line of above ground pool fencing by Vinyl Works Canada. It have come to our attention that many websites are using the same picture as us but selling the lower lower quality or Economy grade of pool fencing from Vinyl Works Canada. Make sure you know what your getting.